The world's most famous puzzle is the still the best selling puzzle of all time! Includes collectible stand. In a classic Rubik's Cube, each of the six faces is covered by nine stickers, each of one of six solid colors, (traditionally white, red, blue, orange, green, and yellow). A pivot mechanism enables each face to turn independently, thus mixing up the colors. For the puzzle to be solved, each face must be returned to consisting of one color. The original 3x3 Rubik's Cube. This incredibly addictive, multi-dimensional challenge has fascinated puzzle fans since the creator Erno Rubik brought it to the world in 1980. 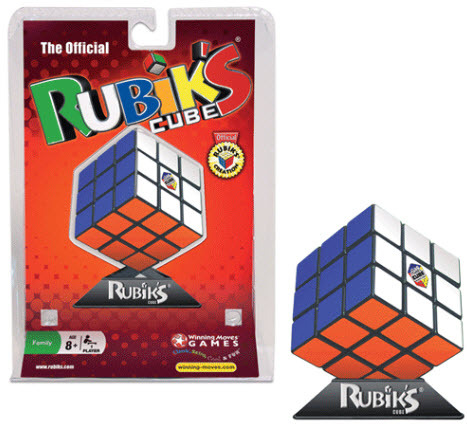 More than three decades later the Rubik's Cube is still the best selling puzzle. With "43 Quintillion" possible moves and only "ONE" solution. Nearly one in every five people in the world has twisted, jumbled and enjoyed this immensely popular puzzle.